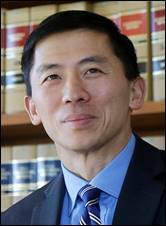 In this 2017 file photo California Supreme Court Associate Justice Goodwin Liu pauses in his office in San Francisco. His comments come on the heels of a March 13 executive order by Gov. Gavin Newsom imposing a moratorium on executions in California. The last one occurred in 2006. Lui pointed to disparagement of the current system by Chief Justice Tani Cantil-Sakauye and her immediate predecessor, Ronald George. Cantil-Sakauye wrote for a unaninimous court in the case in affirming the death sentence of Thomas Potts who brutally murdered an elderly couple during a robbery in their home. Her opinion rejects various contentions including instructiuonal error and prosecutorial misconduct. The case is People v. Potts. The opinions appear in today’s Slip Opinion Supplement at Page 1407.